The Buzzer blog » Attention Metrotown SkyTrain riders! Some more changes are coming to Metrotown Station as we upgrade one of our busiest stations outside downtown Vancouver. Beginning November 16, a portion of the centre stationhouse will open! 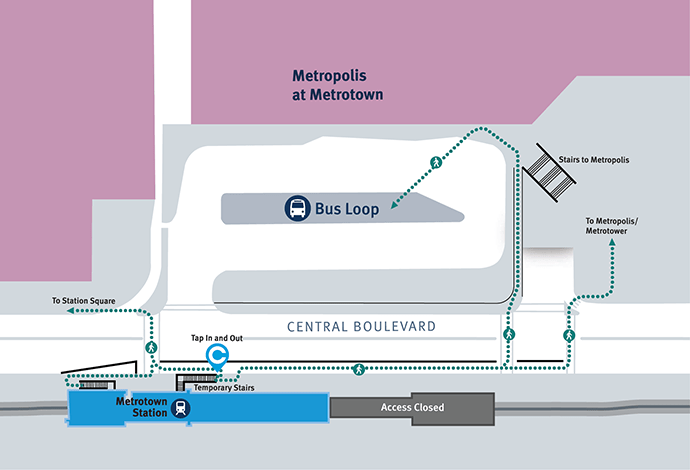 To allow for demolition to begin on the existing east entrance, the pedestrian walkway at Metrotown Station connecting the mall and bus loop will permanently close. The station upgrades allow space for an overhead walkway to be built, however, TransLink does not own the property and it will be up to the discretion of the City of Burnaby. We are currently working with the city to agree upon design, construction, funding and timing for the a new walkway. Not to worry, the station is still accessible for riders! You can exit the platform via the brand new stairs in the centre stationhouse towards the east of the platform or the emergency staircase at the west end of the platform. The future bus lane will be used for passengers to travel east or west along the south side of Central Boulevard. Concrete barricades will be installed to separate pedestrians from traffic in that area. Compass Vending Machines and card readers will be located just outside the station, so remember to tap in and tap out to ensure you are paying the correct fare! To help direct riders during this construction, additional staff will be on hand, but you should still allow for an additional five to 10 minutes of travel time when using this station. **Please note** There will be no escalator access into the station, only stairs. The HandyDART and Community Shuttles will continue to run between Metrotown and Patterson stations until the new elevators open this spring. Looking for more station upgrades or Metrotown information? Joyce-Collingwood SkyTrain station is about to get a makeover! I’m sorry… are you people crazy?! You’re taking down the existing foot bridge and you’re NOT REPLACING IT?!?! It was bad enough there was going to be a period where the old bridge was closed before the new bridge was built—but now you’re saying there are no guarantee there will even be a new bridge?! That’s both misleading (all indications were that there would be a new foot bridge) and appalling. Do you *know* what a safety disaster it will be to have that many pedestrians crossing at street-level into and out of Metrotown?! If it wouldn’t mean someone is going to be seriously hurt (or even killed), I’d look forward to the lawsuits you and the City of Burnaby will be subject to because this is a perfect example of completely avoidable negligence. A new pedestrian bridge for the renovated station is not a “gee wouldn’t it be nice to have?” luxury, it’s a fundamental requirement. To think otherwise is ludicrous. Lol, it says right there that Translink can’t do anything about it since it’s not their property. How would you like it if I came to your house and built a shack on your lawn without permission. Hi Joey, the possibility refers to the “when” which we don’t know because it is not our property or our funding. I have changed the language to make that more clear. Thank you. One of the most frequent SkyTrain stations absolutely WARRANTS the construction of a new bridge. Does TransLink ever wonder why people think it is incompetent? It’s because TransLink is obviously incompetent! STOP THE PROJECT. Today. Leave everything exactly as it is right now. Sit down with Burnaby. Come up with a solution. Communicate it to the public. Take feedback. GET IT RIGHT. STICK TO IT. No surprises. Since that won’t happen, I’ll be doing a lot less shopping at Metrotown, and I won’t be climbing the “temporary” stairs into the “temporary” station. TransLink had best double or triple the Patterson shuttle service. As long as the lack of a walkway is temporary. $5 million (or whatever amount) on a new walkway is better than $5 million on personal injury lawyers. The station upgrades allow space for an overhead walkway to be built in the future, however, the decision remains in the hands of the City of Burnaby as TransLink does not own the property. We are currently working with the city to agree upon design, construction and funding for the a new walkway. The problem isn’t that the wording was unclear, the problem is that there’s no indication of even an intention of having the bridge in place when the station improvements are complete. “In the future” could be 5 years from now! And pointing the finger at the City of Burnaby is petty and unwarranted—TransLink should never have started the renovations without securing the City’s go-ahead for a key part of the renovations, which is the construction of a new bridge. It’s not like the leadership of the City of Burnaby has suddenly changed or anything since the renovations were planned or began. So I agree: the question is of “when.” However “in the future” is not a good enough answer to that question. Hi Joey, please see my response to all. It is indeed about “when.” We cannot give a specific time frame because we have been, and continue to be, in talks with the city and the mall to agree upon construction, timing, etc. Not about blame whatsoever, it is who is the owner of the property and we need to work with them to find a solution that works for all involved. Thank you. The original plans had us opening the centre stationhouse when the elevator construction was complete. However, partially opening the centre stationhouse allows us to minimize the overall construction duration. We recognize that stair-only access to the platform has a major impact to our customers, but this option allows us to keep the station open for the thousands of customers who use it every day. A HandyDART shuttle will continue to operate between the Metrotown and Patterson Station HandyDART stops for passengers with disabilities. Passengers travelling with strollers can continue to take a Community Shuttle to Metrotown Station from Patterson or Royal Oak stations. Both have plenty of capacity for those that need them. 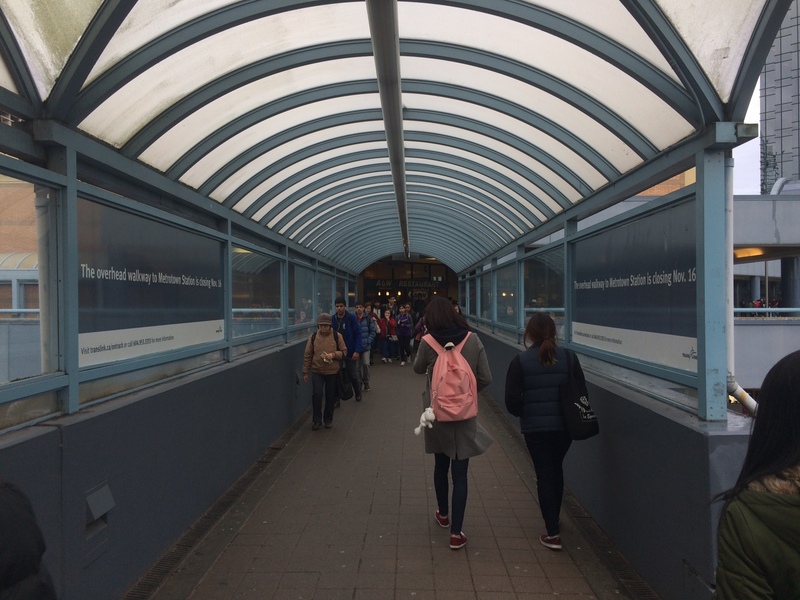 We are currently working with the City of Burnaby on an agreement for a new overhead walkway, that will be funded by the City and we will share that information as soon as it is finalized. As someone who uses Metrotown Station every day — I need to stress the absolute necessity of having a functional pedestrian walkway / passerelle over Central Boulevard. I am so disappointed and frustrated over how this topic has been seemingly shrugged off (not just by TransLink, but also the City and the mall owners) throughout the planning and construction process. It is something that has worried myself and other customers since the beginning of the project. It doesn’t matter who owns the property. It doesn’t matter who’s funding responsibility it is: this is not the first time TransLink has had to work with outside stakeholders on an important public access issue. This should be a top priorty feature of the project. Just at how much attention the pedestrian walk way at Commercial Broadway has received. I understand the reality that the existing structure has to be closed to move forward. I agree that temporary inconvenience may be worth the improvements promised. This should only be an extremely temporary measure, however, (weeks or single digit months only) as it will make the experience of using Metrotown station less safe and more frustrating than ever. I am not looking forward to crossing this very busy road every day, with hundreds of other customers, and no resolution in sight. Please take this issue seriously. I look forward to hearing more about a timeline for the pedestrian walkway soon. Hi all: Thank you for your comments and concern on this. It’s your contributions that make this blog great! I’m in regular contact with the team working on this project and have been forwarding and asking them to read through these comments. What I would suggest is that if you’re really concerned about the walkway or anything to do with the Metro Vancouver transit system, that you also fill out a feedback form – http://feedback.translink.ca/ and click the button for a response required. This is yet another way to have your voice and concerns heard and documented. What we’ve written in this post and in the comments section is all that the social team has info about this at the moment. I can tell you 100% that once we get an update about any new info on this from TransLink or our partners, we will blog about it. You can bet on that! There are LARGE SIGNS informing passengers that the Skywalk is CLOSED. However, the Skywalk is NOT closed until Wednesday, November 16th. Translink has these signs printed WITHOUT putting the closure date of November 16th. Just another inefficiency on the part of Translink. Also, Translink needs to put another HANDYDART SHUTTLE in service. There used to be 2 buses, but only 1 now and the wait is longer. Hi Lynn, our signage for the walkway closure does include the date (examples can be seen right on the walkway itself) and are written in English, traditional Chinese and Punjabi. The signs went up November 3 to ensure customers were given ample notice. If you are referring to any other signage at the mall, That would have been put up by the mall itself and we don’t have any ownership of those signs. However, we have been working with the mall to make sure customers of both Metrotown mall and SkyTrain station know about the closure, including giving post cards to mall information desk staff. Thanks! I would like to say that I use Metrotown Skytrain station almost 7 days a week and the platform at this time is a nightmare, I am truly surprised that no one has been pushed onto the tracks, slammed into construction boards by running passengers etc. I would think that under fire and safety rules you are required by law to have two exits and at this time you don’t and are not likely to, if there is an emergency, how is a paramedic and their stuff supposed to gain entry to the platform? I have looked for signage to point out where the community shuttle from Patterson to Metotown is and nothing and most of your staff point at the bus loop and say over there, perhaps ample signage would be helpful? It would be helpful to actually have signage up where the escalator is advising people that the whole entrance is closing, because as of today, there is nothing. There needed to be contingency plan in place and you don’t have one for this station that works because you didn’t bother consulting the people who actually use the station. Considering how many people use the station, what you are proposing is a disaster waiting to develop. I went to Metrotown Station today and took the center stationhouse stairs down. I didn’t see a ticket validator anywhere, which is going to be a problem for anyone trying to tap in / out of the station. Also when I walked over to the crosswalk by Station Square I couldn’t see the button to push for the walk signal. The lights did eventually change but the walk signal didn’t come on (and I’m pretty sure a bus driver gave me the evil eye for crossing without it). Plus when I went to the mall customer service for those info post cards, they had no idea what I was talking about and didn’t know the pedestrian walkway is closing tomorrow. I had our Comms team reach out to the Project Manager and Community Engagement teams to find you some answers. Regarding the Compass readers: Four Compass readers and five Compass Vending Machines (CVMs) are set up at the entrance to the station so passengers can purchase fares and tap in and out of the station. There is also a Compass reader at the exit of the west staircase, so customers can tap out as they exit. Pedestrian button: All three crosswalks are pedestrian controlled. The button is located near the crosswalk (look for the highlighted area at the construction fencing). If a customer is coming from the centre station stairs headed toward Station Square it’s set back and to the left. Awareness: The mall has been in the loop throughout the entire process and they received and said they distributed the community update. They have also been posting about it on their social media channels like Twitter. I hope that helps! Thanks, Sheba. Absolutely insane. Come to an agreement before shutting it down. This is going to stop a lot of people from going to Metrotown because it won’t be worth the bother. Sure, build a new walkway, but do it before you cut the other one off. How is that not common sense? If that’s the case, they should at least bring the 129 bus back to Metrotown! This should help with congestion. Letting the 129 stop at Patterson is just cheating, Translink. My only concern for this is rush hour. Your temporary stairs will be so pack while passengers going down the stairs it will be very difficult for other passengers to climb up the stairs when it’s really packed. I’m afraid those stairs won’t do. Also, I would like to STRONGLY emphasize the idea of NOT having people with strollers at Metrotown! They take too much time and space when using the stairs which is absolutely ridiculous. It would be nice if they REALLY use that accessible shuttle at either Patterson or Royal Oak to reduce this problem. I really agree the overhead walkway is necessary. But instead of piling on Translink, who has cleared showed us it is the City of Burnaby who holding up the process, is they someone there we should contact? I think Burnaby would do well to receive the feedback people are directing at Translink. I was at Metrotown station yesterday. I found the new setup exceedingly inconvenient and inefficient. That bridge allowed people to travel between the station, the mall/bus loop, and Station Square without getting into traffic or being in the rain/snow. Now travel time has increased dramatically for many of us who used the overpass regularly. I had hoped the closure of the bridge would be a relatively brief transitional inconvenience, so I’m very disappointed to see that it’s not getting a replacement any time soon. How did such a bad decision even get past public consultation? Several Translink depictions of the renovation feature an overpass. Now it seems like false advertising. I went back to Metrotown today and the validators were there. They weren’t installed the time before (they prob came along later in the day). The walk signal button being behind the fence makes it a lot less noticeable. If not for people’s comments (and from being there before) I don’t know that I would have seen it today as it’s not in the most intuitive spot right now. The neon orange paint helps anyone who knows generally where to look for it. Awareness seems to be pretty low. About 90% of the people I’ve talked to didn’t know the existing entrance was closing this week – and that includes people who work in Metrotown. Speaking of awareness – is the temporary emergency staircase open??? From Central Blvd I only saw signs pointing to the center stationhouse stairs. Trying to get up those stairs at the same time a crowd is trying to get down them (which is most of the time) is slow going. Hi all: Thanks again for the comments. We’re continuing to forward them to the Project Manager and Community Engagement teams. Jordan: Concerning the City of Burnaby who own the walkway, I don’t have contact # for a specific person, but you can always contact them via this link – https://www.burnaby.ca/our-city-hall/contacts-and-location.html I see that they have a link to a feedback form. There was a line-up to both descend and ascend the staircases today at Metrotown during peak and non-peak hours. This added well more than the anticipated delays to my trip as a student who already gets up at 6 to commute. How and when will this be resolved? I would like to know which company is in charge of the workers co-ordinating the flow of pedestrians across Central Boulevard from the Skytrain station to the bus loop. They are extremely, extremely unprofessional, rude and practice unsafe methods. Which company are they representing? Please let me know as I will be taking my complaint to the very top. Today there was un exceptional amount of snowfall and the road was very slippery and slushy. Of course people, especially elderly people, were taking their time to cross. These workers, however, would shout things along the lines of, “Come on! Let’s go! Hurry up! Let’s go!” I managed to stop an elderly gentlemen from slipping because someone was shouting at him to hurry up. So they would get a kick out of seeing someone slip over in the snow? I shouted that surely pedestrian safety takes precedence here? I got a grunt as a response. I need someone to let me know who I can speak to regarding this as I cannot let this slide. Talk about dissing your users. Do any of you realize just how childish and impatient your bus drivers are? Right now they throw tempertantrums when they try to exit the bus loop. I hope that is someone gets struck by one of your buses, they sue Translink for everything they have.